What makes a good mechanical puzzle? The topic seems to come up from time to time on the usual puzzle forums and it’s always interesting to see the variety of responses – there almost certainly isn’t ever going to be a single, agreed answer. Heck, I doubt you could get firm agreement on what aspects should even be considered, let alone their relative importance or how to combine the various aspects that make them up! It probably sounds obvious, but it should have a clear goal – any mechanical puzzle that needs a significant explanation of what the goal is, is unlikely to be a really great puzzle – give anyone a scrambled twisty puzzle and immediately they know that they need to get the colours on the faces matched up … they might not know how to achieve some aspects of the solution without consulting an algorithm, but everyone intuitively knows what to try and do with them. (Yes, I know that it’s less obvious with some shape-shifters where you might not be able to even recognise what the target shape should be, but you get the point – stop trying to be difficult!) Multiple sequential goals, each of which logically tees up the next are even better (and I’m thinking of some of Pavel Curtis’ puzzles here where you uncover them one layer at a time, a bit like peeling an onion). When it comes to mechanical puzzles, fewer bits are always better than lots of bits. 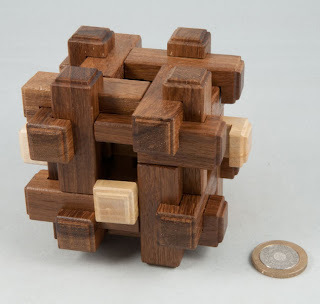 Making puzzles harder by adding pieces may make them more complicated, but it doesn’t necessarily make them any better. Think of the two-piece pyramid puzzle – two simple little pieces have to be combined to make a tetrahedron (or pyramid, if you aren’t among friends!). 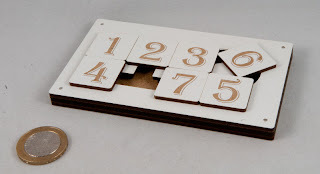 There’s a real elegance that comes from having a smaller number of simpler pieces to a puzzle – in my books, some of the best packing puzzles have four simple pieces to fit into a tray. Your brain tells you it should be simple – experience tells you it isn’t! Good puzzles should provide at least a reasonable challenge – they need to keep you occupied for a bit at least (are they really puzzles if they don’t?) – they need to earn some respect before they give up their secrets. I always find it a bit of a let-down when I look at a new puzzle from a distance, decide what the goal probably is and then take a guess at the likeliest solution only to find out that’s exactly what it is when I pick it up and just apply the solution – and I fully realise that it all depends on what you’ve seen before and how much experience you have of solving mechanical puzzles, and that to some extent your views will be influenced by when during your puzzling life you came across a particular puzzle and how on-your-game you were when you first saw one – but I guess what I’m really saying is that trivial puzzles with an obvious solution aren’t likely to be high on the list of great puzzles in my books. There’s probably a down-side if puzzles provide too much of a challenge … I’ve spent hundreds of hours (literally!) on a single puzzle spread over several months before I finally cracked it –and trust me, the sense of achievement was pretty sensational – but I don’t think there are many puzzles that I’ll invest quite that much time in. There are other sorts of puzzles that (for me) take a lot of thought away from the puzzle itself – so they tend to sit on my bookshelf above my desk for ages – and every now and then I’ll take them down, try a couple of things and then put them back and leave them alone for days or weeks at a time – Roger puzzles fit this category rather neatly – I find they need you to try lots of things, often unusual things, and they can be pretty devious little things … in fact at the moment there’s a row of three of them that have been staring at me for quite a while now … all unsolved, so far …. 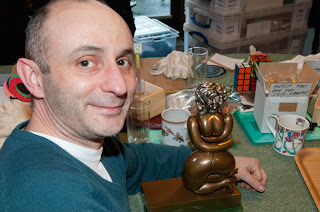 Good puzzles give you a sense of achievement – and to some extent I suppose that’s the flip-side of the previous point. Everyone (OK, we puzzlers…) loves conquering a puzzle and getting the better of it – proving that you’ve found the right technique to work out what the internal mechanism must be to release that final catch and open the box – or be able to deduce how to fit those shapes into that tray in a way that your brain wants to tell you cannot be efficient enough. Good puzzles give you “A-ha! moments”. Great puzzles give you several of them. For me personally, these are the drug that makes solving puzzles so addictive – that briefest little moment of insight that comes after trial and error and thinking deep thoughts when suddenly there’s a tiny flash of inspiration and an inkling that that might actually work – the moment when the grin creeps across your face no matter how jaded or experienced you are when you realise that you’re onto something useful. That’s the real buzz of solving puzzles for me – that’s the bit I remember best about solving puzzles … it’s that first time you spot something behaving unexpectedly and then wondering why it did that, or postulating a theory about what might be in there and then coming up with a way of testing the theory, trying it and realising that it might actually be part of the solution. Call me shallow, but I like puzzles to look attractive as well – and I guess this is where we seriously start getting into the realms of personal tastes! 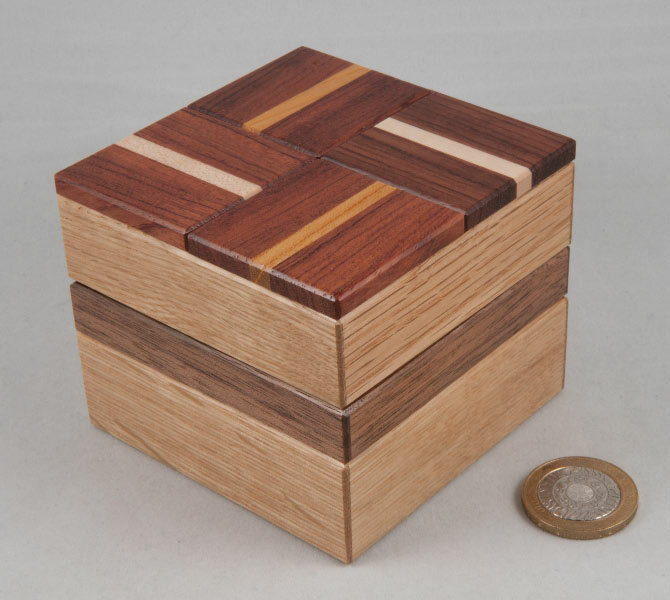 I really think that a beautifully made hardwood puzzle looks inviting and displays well – I like the idea of puzzles that look good on their own in a puzzle cabinet, ones that look a bit different and ones that show off their creator’s skill and craftsmanship. 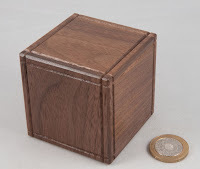 I also think some puzzles should get bonus points for things like having an extra little hidden compartment in a puzzle box beyond the main challenge, or for being puzzler’s puzzles – where they’re specifically designed to use a puzzler’s knowledge of similar puzzles against them finding the right solution … often resulting in non-puzzlers who are unencumbered by “knowing what the answer should be” being able to solve them faster than “real puzzlers”. 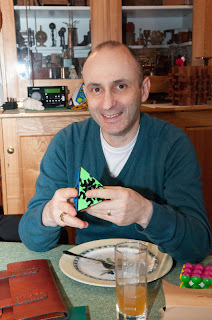 …so that’s what I think makes a great puzzle – what do you think? 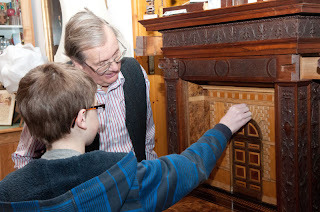 When some Midlands Puzzle Party participants couldn’t make the last trip down to the Puzzle Museum, James Dalgety kindly offered to host another bunch in the New Year – and so it came to pass that another bunch of puzzlers headed south this past weekend. Adin (mental note: as in the mathematical operator, not the country!) brought his fiancée Sophie and Jez brought his son Charlie, Richard Gain joined us from way up north and Kevin took the train down as far as Taunton and I picked him up from there on my drive down from Brum. This time we heeded James’ warnings about low-slung racing cars (Nigel’s Three-series took a bit of a hammering on James’ drive) and not relying on a sat-nav for the bit from Taunton – so I picked Kevin up in the Golf [Ed: which in my world is a completely normal car!] and he navigated from Taunton – he did a great job of navigating us there – unfortunately I did a less good job of getting him back to the station that evening and ended up doing some rather interesting manoeuvres en route – but in my defence, I got him there on time! We spent a little while unpacking our humble contributions for James’ amusement (a couple of Stickmen, some Makishi’s and some twisties, along with a box-full of Richard’s micro-cubes) before the first half of the tour began. Even though I’d had the tour last time, I was keen to loiter around within earshot because I love hearing the stories behind the puzzles and what makes them important or unique or interesting to James. When the tour reached the first of the main glass cabinets, there was a noticeable intake of collective breaths when everyone realised that the cupboards underneath the glass cabinets were jammed with drawers that were in turn jammed with antique Japanese puzzle boxes … and it all went downhill from there! We managed to just about get around the first room before Lindsey announced that lunch was served, so we stopped and feasted on a tremendous spread for a while. There was a lovely laugh from Lindsey when one of the guys asked her if this was really the family dining room – we’d just about managed to clear enough space on the table to fit our plates and drinks among the piles of puzzles and James had adopted his usual perch on his rather nifty fold-up staircase. I suspect that Lindsey’s response was shorthand for “In theory, yes, however….”. After that little interlude we all lapsed into a bit of puzzling, with some of James’ Berrocals being brought out to play – I’d decided I needed to have a bash at one after spending almost all of my time on a couple of boxes last time so I asked for an interesting one – and after a bit of discussion we settled on Romeo and Juliet, which James duly set down on a piece of carpet in front of me (probably a puzzle mat, come to think of it!). 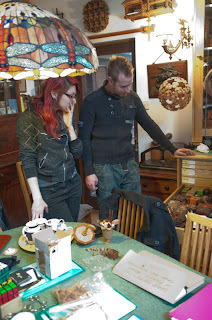 Kevin and Adin set about demolishing (and rebuilding) most of the anvils on one of the side tables – when James removed the first one, he decided that the table needed dusting so they would have to work their way through each one in order to enable him to dust the table properly … which is as good an excuse as any to have to work your way through several highly valuable intriguing puzzles! While I slowly plodded through dismantling Romeo and Juliet, Kevin and Adin motored through the anvils – every now and then they’d ask James a question or two, and I just plodded along … after a little while I had a mat full of bits spread around more or less in the order I’d managed to remove them – so James wandered over to congratulate me, and mix up the parts a bit – nice chap, eh? Needless to say, reassembly was significantly harder than disassembly! Romeo and Juliet has a central pair of articulated pieces so the first order of business is reassembling those from their constituent parts and then figuring out where all the other bits go – the resulting process involved a lot of trial and error – usually about which order things need to go back together again because as you progress, you find the articulated bits have less and less movement, invariably this results in having a piece you want to fit in and not having enough range of movement left – so you take a few bits off and then retrace your steps – which is easier said than done – especially the first few times because the pieces are all rather unusually shaped and a bit disorientating – and remember that the two main bits are constantly changing shape as well… a couple of times I thought I was well on my way only to realise that I should have inserted a crucial piece right at the start … and unlike a wooden puzzle, there’s absolutely zero give in these bronze beasts! It may have taken me the (very) best part of an hour, but I managed to get it back together and remounted (in both senses – this is a Berrocal after all!) without relenting and accepting James’ kind offers of the instruction manual. (Yes, I took that long that he took pity on me twice and offered me the instructions!) Romeo and Juliet is definitely fun as a puzzle – the joints make for an interesting puzzle and it’s a whole lot more than a work of art that doubles as a 3D jigsaw. The second half of the tour kicked off just after that and James took us around the next two rooms in double-quick time. Half way around the second room James fished an interesting bunch of wires out of a drawer and pulled it open to reveal an incredible three dimensional lattice of wires with one of John Kostick’s four axis stars at each intersection – when I mentioned the artist’s name, he promptly pulled out one of John’s single four-axis stars as well – I mentioned it to Jane Kostick in an email that evening she was quite intrigued as John hadn’t made any of those in more than 20 years. 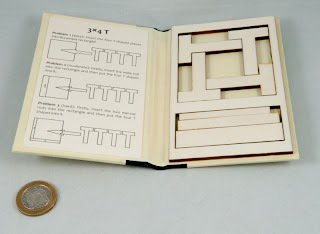 I also picked up a mint condition copy of Edward Hordern’s book on sliding puzzles as I was leaving – I’m going to be in James’ debt for quite some time and may need to pick up several more loads of burrs for reassembly in order to make up for his kindness. Thank you James. You sir, are a scholar and a gentleman and we remain in your debt! 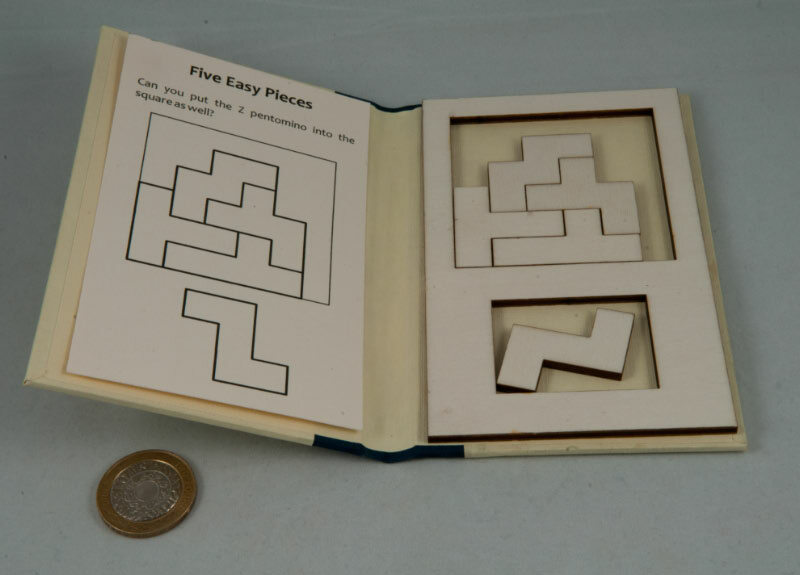 A while back I mentioned I’d found a couple of delightful little puzzles bound to look like books, on Bernhard Schweitzer’s stand at the Dutch Cube Day. 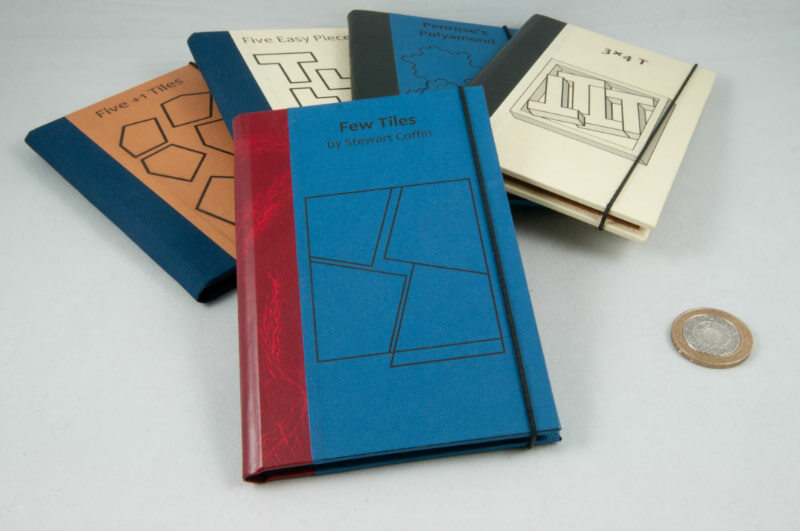 I’d picked up a copy of Coffin’s Few Tiles and had really enjoyed the puzzle and rather liked the presentation … and shortly after I put up the blog post, Peter Gal, whose fine handiwork had produced the books, got in touch. A little while later I’d sent him some Paypal and he’d popped some books in the post … a few weeks after that, the books arrived, having been caught up in the Christmas post black hole, none the worse for wear. Peter has a great range of books, including a bunch of more educational rather than puzzling ones, e.g. there’s a great representation of Pythagoras’ Theorem that physically demonstrates the formula by having a dissection of the pieces of the square sitting on the hypotenuse form two squares that each sit on the other two sides of the triangle – well worth looking at. Selfishly, I was more interested in the puzzles and acquired a handful of them, including a copy of Peter’s IPP31 exchange puzzle – TriPenTile, but I'll leave that one for later. 3*4T is a variation on the old 4 T’s puzzle…my earlier version of the puzzle came from Thinkfun but I suspect there are probably a few versions out there – it has a double sided tray and the challenge is to pack the four T’s into each side … one of which is trivial, and the other requires a bit of lateral thinking. Peter’s version takes that idea and develops it even further, providing three challenges instead of two. The starting position (Challenge 1, technically) has all of the T’s orthogonally arranged in the tray-space and then a series of extra pieces is added to restrict the size of the tray and each time your goal is to place the 4 T’s back into the ever smaller tray… it’s not hugely difficult, but the extensions are great and make for a neat couple of challenges in a handsome package. A nice little puzzle for introducing new puzzlers to the art of packing puzzles. 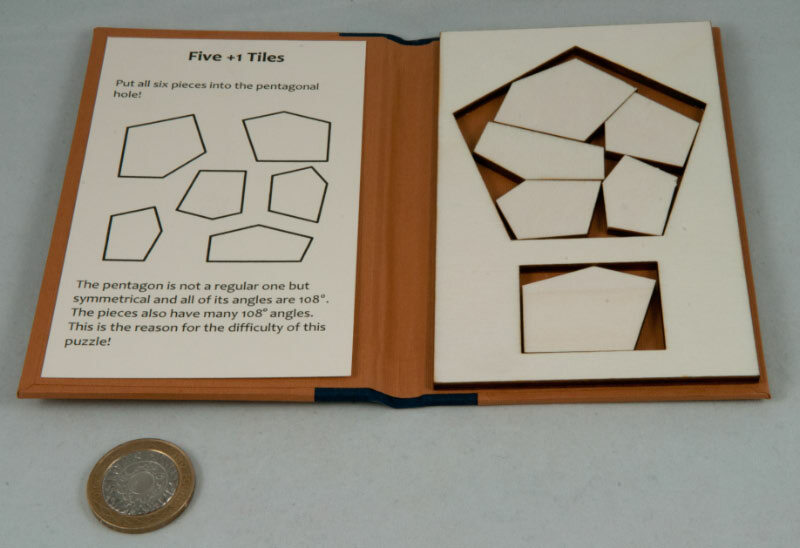 Five + 1 Tiles is a pentagon dissection puzzle – at first I thought it looked a bit like Markus Goetz’s puzzle over here – but a quick look at the pieces show it’s a totally different puzzle … there’s a pentagon-shaped tray for you to pack the six pieces into, and a space below it for one of the pieces so you can store it unsolved ready for the next victim. Five Easy Pieces is another classic Coffin packing puzzle. Objective: five simple little pentomino pieces to pack inside a square tray that’s just a little bit shy of 6 units square. 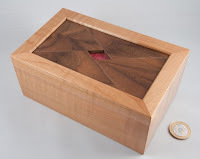 There seems to be so much spare space in that tray when the Z-pentomino is sitting in the spare hole down below that this can’t possibly be much of a challenge ... except, this is a Coffin puzzle – so of course it is! 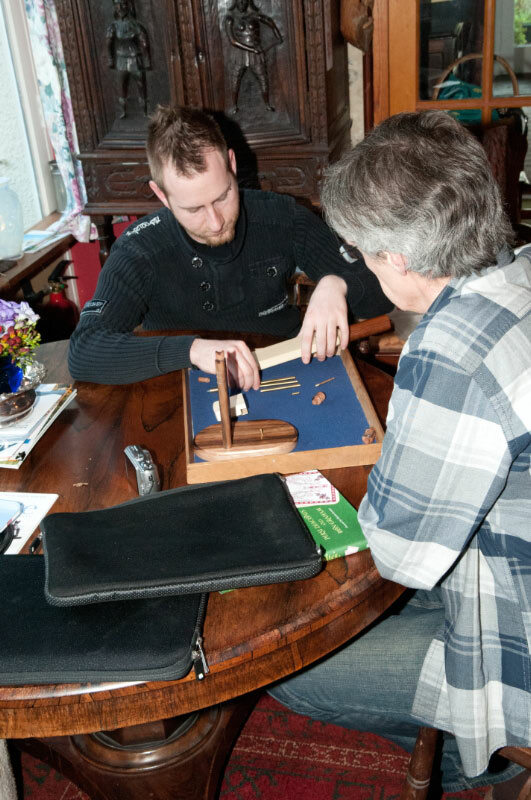 Stewart C has used all of his keen observations on how people set about solving puzzles to pick just the right combination of pentominoes to totally snooker most puzzlers. Some experimentation will almost certainly have you convinced that this thing isn’t possible – even trying the usual sorts of tricks doesn’t seem to solve this one ... it is very sneaky ... and Peter’s implementation is very sweet! 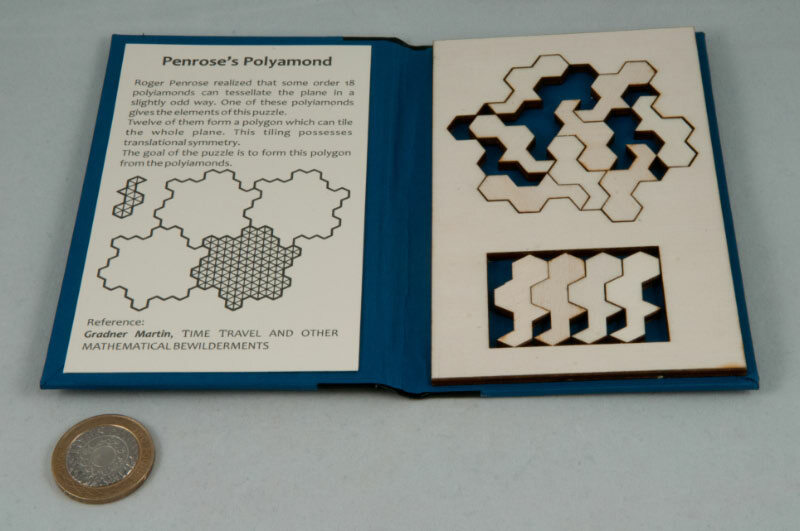 The last of the little books I got from Peter is a cute little packing problem based on Roger Penrose’s Polyamonds. The twelve identical pieces are all order 18 polyamonds, i.e. they are each made up of 18 equilateral triangles. 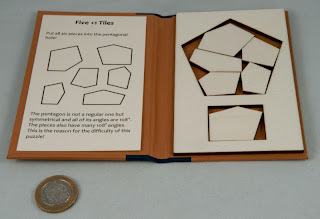 Those twelve pieces then pack into a polygon that looks a bit like a hexagon if you squint at it, and that polygon will in turn tile the whole plane ... so starting from a pretty unusually shaped basic piece, you can effectively tile the plane – yeah, I know, mathematicians are weird! This puzzle asks you to find that tiling and it’s a neat little challenge ... it’s made a bit simpler by having the outside edge given to you and that cuts down on a lot of the possible starting points, but it’s an interesting construction that my brain was telling me is unlikely to actually work – and yet it does, rather neatly. I’m very chuffed with my little collection of Peter’s puzzle books – they look great and each provide a neat little self-contained challenge. Peter’s handiwork is terrific and the laser-cut wooden bits ensure the puzzle works exactly as intended (!). 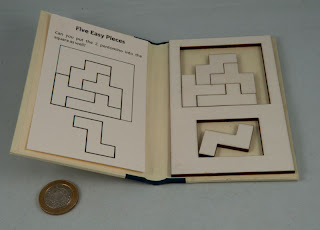 I highly recommend these little books as travel puzzles or unintimidating puzzles to introduce folks to packing puzzles. Peter’s great to deal with directly and his prices are jolly reasonable too ... drop me a note if you want to get in touch with him. 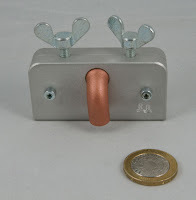 Last year some time the Mr Puzzle website announced that Brian would be making a short run of one of his horribly complicated burrs called The Collective, and invited anyone interested to sign up for an alert … well it couldn’t hurt, could it? A while later they began taking pre-orders for them, and it would have been rude not to, wouldn’t it? …and then just before Christmas Sue got in touch to say my copy was ready, so I sent some Paypal in a southerly direction and a few days later my puzzle is headed in a northerly direction, just missing the tail-end of the Christmas mail madness. The Collective is one of Brian’s own designs and was entered in the 2002 IPP22 Puzzle Design competition. Now the web site is pretty explicit about this puzzle – it is clearly a very mean burr … not just because it has a lot of pieces, or because most of them aren’t necessarily shaped the way you’re expecting, or because there’s a twist in the tail, but mainly because assembling this monster requires more hands than most of us possess – or a jig which I’d like to think that Brian has hidden somewhere in his workshop if only for his own sanity when he has to assemble a run of these things! Although it’s not a particularly high level burr, the required dexterity will test anyone – take my word for it! 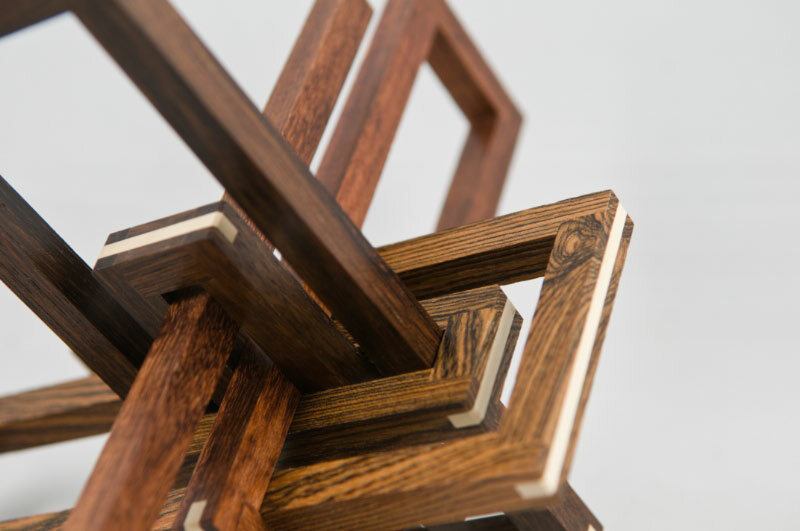 Right – having a look at it, made in two distinct woods, it’s pretty easy to recognise it as a five piece (!) burr inside a cage. There’s a fair amount of not-particularly-useful movement in the beginning, but after a while you discover what you can do with the internal burr … of course that just gives you a messy looking puzzle with bits of burr projecting out of the cage … it doesn’t seem to actually be very useful at all – and indeed it took me quite a while to work out where to go next – and as usual it was during my random bits of experimenting that I stumbled across something that might just turn out to be useful. Problem was, if I was right, this wasn’t going to be pretty. ...a few moves in ... now what? Of course, being the inquisitive puzzler I probably am, that phase didn’t last very long and soon enough I had it all in bits on the desk – and boy are there a lot of bits in there! (29 pieces all told…) Quite a few of the bits are the same (there are a couple of sets of 6 identical pieces) but the structure isn’t especially symmetrical – it can’t be – for one thing there’s that 5-piece burr in the centre and for another there’s the rather unusual way that it all locks together. Let’s be kind and just say that it took me quite a while to reassemble it the first time, and only slightly less the second (and then only because I found a sneaky way of holding something properly!) – it’s an absolute sod to put back together and I seriously hope that Brian has a jig to make the process a bit easier on himself. Last year I joined the Karakuri Club. Last Christmas I became a very big fan of the Karakuri Club. The Karakuri Club is run by the Karakuri Creation Group – a group of craftsmen producing a wide variety of puzzle boxes under a communal banner. After you’ve paid a joining fee (Y 6,000 or c.£50), you pay an annual subscription (Y 12,000 or c.£100) which gets you a handsome booklet with photographs and brief descriptions of all they’ve produced over the last few years – handy for compiling a wish list! 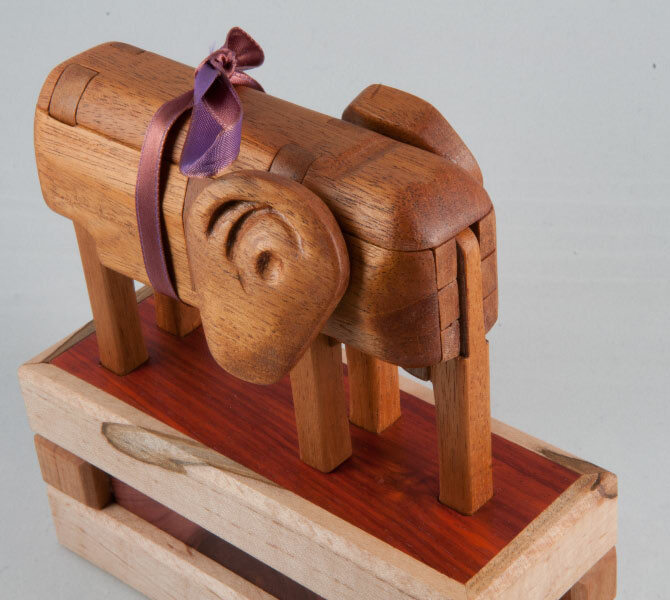 Your subscription also gives you a Christmas present from one of their craftsmen – and you get to express your preference for which craftsman you’d like. You can then add to your subscription (Y 10,000 or c.£83) and increase the number of Christmas presents you receive and nominate additional craftsmen … and there’s just one catch – you pay up in the first half of the year and have no idea what you’re going to get at the end of the year – chances are good you’ll probably get a work from the craftsman you’ve chosen, but you don’t know what he’s going to be producing this year … sure you can look back at their past works and get an idea of their styles and the sorts of things they’re likely to produce, but there’s no guarantee that your guess will be anywhere near the eventual outcome! In fact, if your choice turns out to be too popular, you might not even get something from your preferred craftsman – you’ll get something from one of the others … if that sounds a bit hit-and-miss, and you’d rather be totally in control of what puzzles you buy, fine – perhaps the Karakuri Club isn’t for you – unless of course you want to make use of the Club discount on all of their products and be able to buy special limited Karakuri boxes that aren’t yet / won’t be available to the general public – so there really is something for everyone. 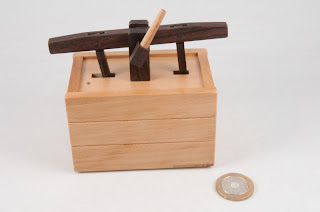 Right, back to last year then – I joined up and decided that I’d just dip my toes in the water and only go for four puzzles :-) – I selected my four craftsmen and included Kamei (you can’t go wrong with a Kamei! 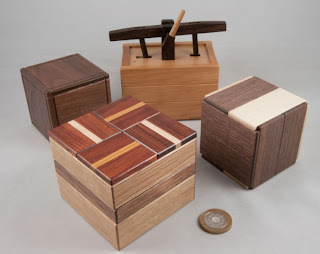 ), Iwahara (someone who comes up with Box with a Tree and Byway Secret, not to mention King-Cubi, is going to be interesting), Kawashima (his cubes look really interesting!) and Tajima (who produces presents based on the Chinese zodiac, and this year is the Year of the Water Dragon!). I duly received my booklet and spent a while trawling through it and making a mental wish list, and then promptly didn’t go and exercise my Club discount at all last year – what a waste, eh? The booklet is a great reference source for anyone interested in their work I’ve found it handy from time to time to check up on sizes or differences between versions of a particular puzzle…around the middle of the year, the Club gets in touch with everyone to confirm their selection of craftsmen and give them one last chance to change or expand their selection – their organisation is excellent! …and then nothing happens for about 6 months … until a couple of weeks before Christmas when I notice a little speculation on the Renegades forum about when the Christmas presents are likely to arrive, and sure enough, right on cue they begin arriving all around the world just in time for Christmas – so Gill hijacks the package and puts everything under the tree for me, and on Christmas morning I get to open four surprising new Karakuri puzzles – tremendous! 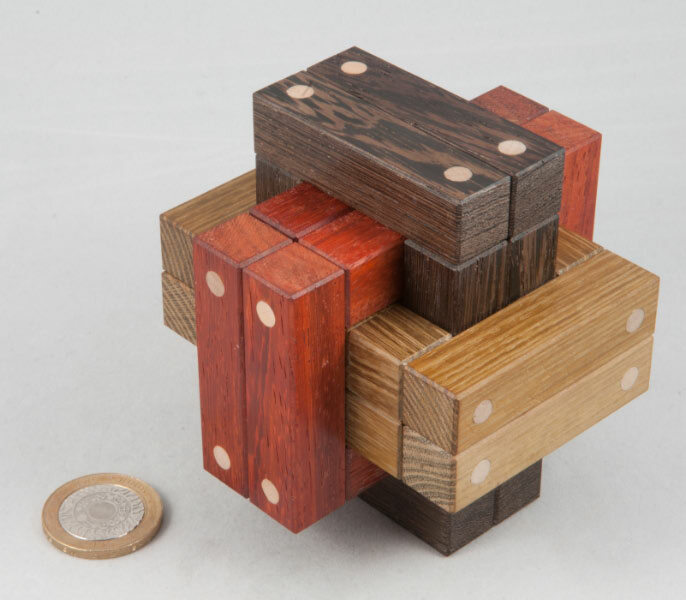 There are some incredible pictures of the logistics involved in packing and shipping these puzzles around the globe on the Karakuri blog over here. 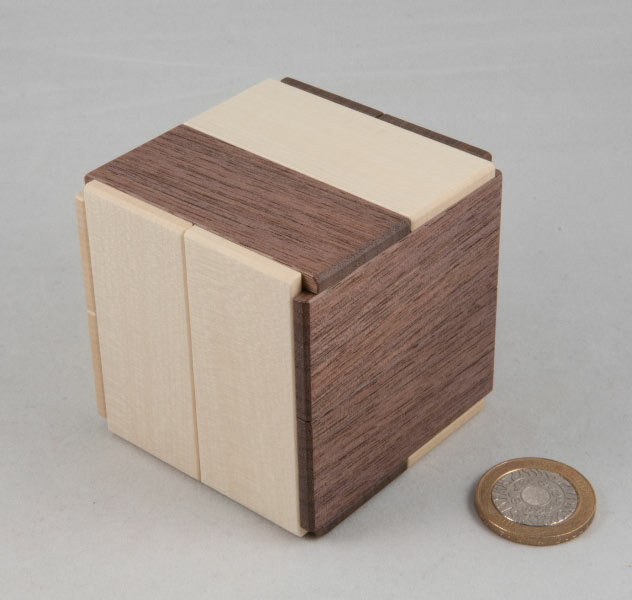 Akio Kamei produced the Rotary Box as his present – it’s a handsome, if not reasonably plain-looking puzzle box made in lovely walnut wood. The side panels of the cube have some interesting patterns that might lead you to believe that the panels slide in a certain orthogonal manner, and while there’s a clue in the name, they move altogether differently to how I was expecting. You need to work out how the different panels interact and how that might be helpful, and there are a couple of dead ends unusual twists along the way, ensuring this is not a simple sequential set of moves where each one opens up the next one and so on…when you do open the box there’s a fair amount of space in there for anything you might like to pop in there… an unexpected and interesting little puzzle. Hiroshi Iwahara produced a variation of his Secret Base puzzle and called it Secret Base 2. There’s a very clear family resemblance and trying the obvious move if you’ve seen the first one, is a good start, but the family resemblance stops there… and it becomes a different little beastie. While there aren’t a lot of moves in the solution, they’re rather nicely hidden and I found myself setting this one aside and then coming back to it a couple of times to try something else before I chanced upon the right combination and sequence – definitely a worthy refinement of the original. Hideaki Kawashima has been experimenting with variations on this particular theme for a while and Twin was his Christmas 2011 variation. Ostensibly this is a cube with two panels on each face, half of which are light and the rest are dark wood. Some of them move separately and some don’t – some sides are all the same colour and some aren’t … and those are all clues in solving the puzzle … as is the name (which you don’t know when you first get it, by the way) which also alludes to the fact that there are two panels that can be opened, each giving access to half of the innards. Each side take about 5 moves to open and every puzzler I’ve given it to (including myself) has found themselves in the self-same dead end – the design is such that we all run toward the solution at full tilt and merrily miss what should have been (one of) the finishing posts … however, having done that, we’ve all ensured that the box is thoroughly locked up! 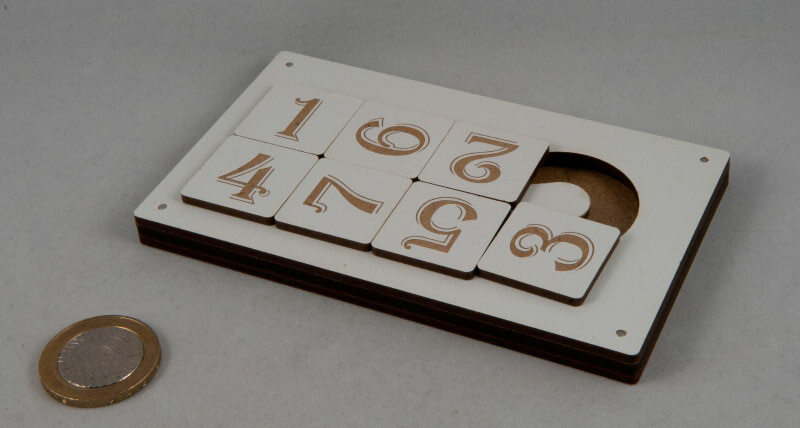 This is a great little puzzle for puzzlers and neophytes alike – with an obvious trap for the puzzlers that will confound them for a while! Once this box is open, the insides are a wonderful sight! The amount of work in there and the fine tolerances are staggering – it’s hard to believe that you’ve effectively only paid £80-odd, for something that clearly has a huge amount of work in it! 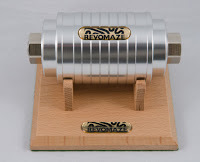 The last puzzle I got was the one I wasn’t expecting – it’s called Pump and comes from Tatsuo Miyamoto. It looks like an old-fashioned hand-operated pump with the majority of its guts hidden inside the box on the bottom. 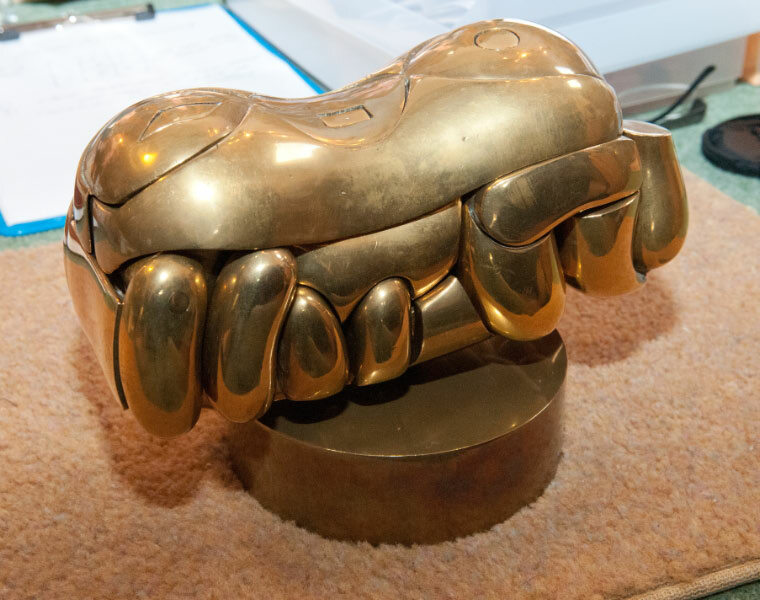 Miyamoto often makes unusual looking puzzles and is particularly fond of making puzzles in forms where the puzzle mechanism is something that the article itself would be doing, e.g. his Latch Box requires manipulation of the turn-buckle and latch as you might in real life with a metal latch. T he handles of the pump move up and down in a see-saw fashion and a bit of prodding around on the box shows a spring-loaded panel on the base. This box actually comes with a suggestion that you play with the puzzle on a flat surface – and the base notably has three angled sections to it – which is a handy clue to the likely movements. 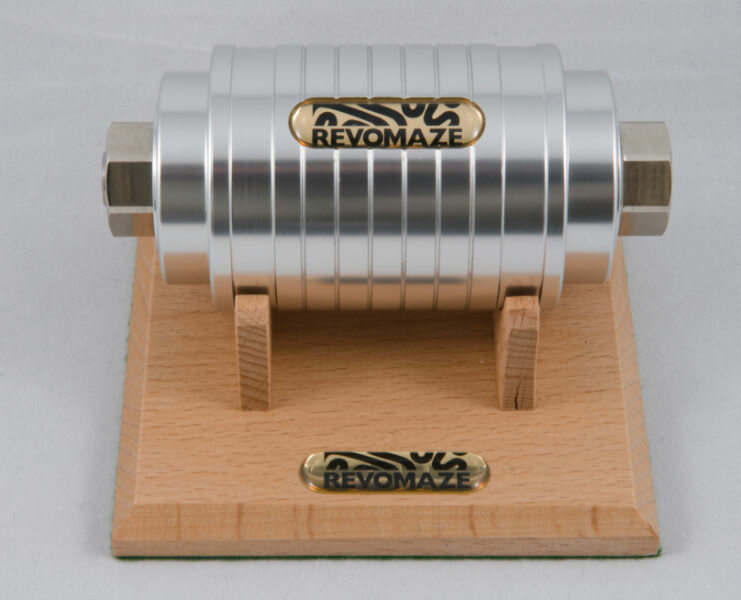 Solving the puzzle does involve playing in different planes while exercising the pump and there’s a delightful reveal when the final move required releases a drawer in the base that flings itself open. 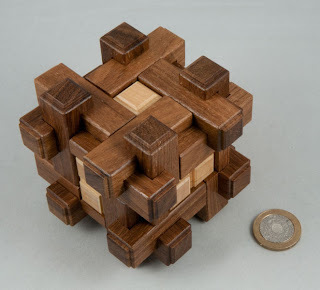 Very cute and way-out-of-the-ordinary little puzzle – and I think I need to ask for a Miyamoto this year from the start. Slidy 7.a.1 is a great spin on what could otherwise be a fairly straight-forward puzzle. I spotted them on the LaserExact! stand at the Dutch Cube Day and thought they looked interesting, but didn’t end up buying a copy (mainly because of all the other things I did buy there!). A couple of months later Wil Strijbos included them in one of his usual newsletters so I ordered a copy. 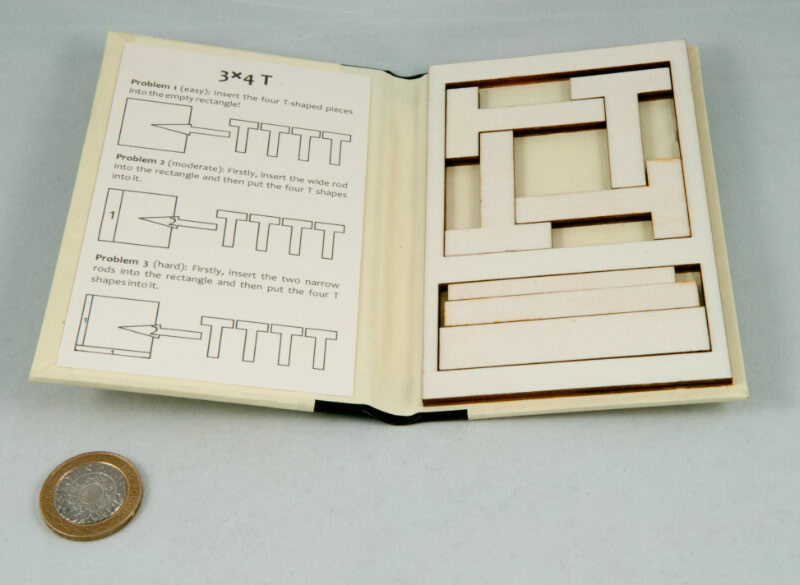 First impression is that this a cleverly designed little puzzle that forms part of its own case. The lid is fastened on with magnets and has a laser etched picture of the innards on the top. Moving a tile along this track from the 7 to the 3 position, twists it 90 degrees anti-clockwise and moving it back in the other direction twists it clockwise. Cycling the closest tiles round and round progressively twists them all the way around until they return to their starting orientation – but that’s not really very interesting… it gets fun when you randomly mess up all of the tiles and then try and return them to their starting position, with all tiles in the correct orientation… invariably you’ll find that when you get all the tiles back to their right places, one or more of them isn’t upright – and you find yourself having to ‘undo’ a lot of your good work, this time thinking a few moves ahead so that you use the final twists to not only put the tiles in the right places but also leave them all upright. 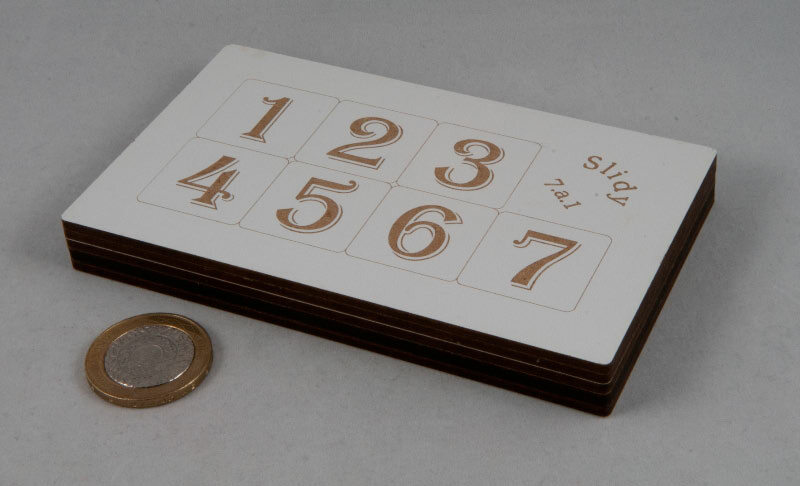 A neat, deceptive little puzzle that provides a nice step up from the standard Sam Loyd Fifteen puzzle.